The Elms is a Grade 2 listed building set in grounds of nearly 10 acres in the centre of Thame, a market town in Oxfordshire. The property is currently owned by Mr Simon Vickers, who is also owner of Rectory Homes Ltd, a property development company (company information). When purchasing The Elms, Mr Vickers claimed the house and grounds were to be refurbished and used as the retirement property for himself and his wife. 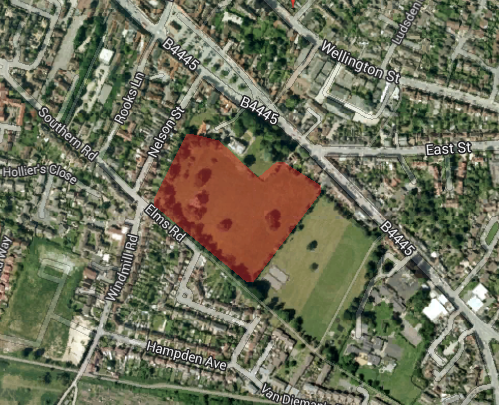 It is understood that The Elms is still currently held in private ownership, despite that, Rectory Homes Ltd seems to be driving forwards the development. The Thame Neighbourhood Plan (page 24) shows the inclusion of 45 houses on the site. It is understood that there could be a set of substantial houses (£1m+) along the north western boundary with the remaining 35-40 houses being built in a concentrated development along the boundary with Elms Park. It is unclear as to whether any affordable housing will be available on this development.